If you were constantly losing track of your keys, phone and wallet and wanted to find these items quickly, Smavida key finder will save you. No more argument! No more hide and seek! Keep track of all the things within seconds! The wireless key tracker has 6 receivers of different colors with six rings to attach(pink/purple/blue/green/yellow/orange) and 7 batteries( 6 for the receivers and 1 for the transmitter). 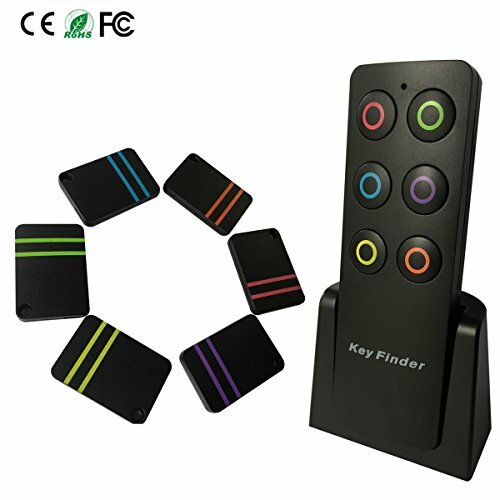 This remote key finder is suitable for personal and family use. The receivers may be a little bit thick to attach to your phone or some smaller items, so you could put the receiver into the key ring and then hang on the items. If you have any questions about this product by Smavida, contact us by completing and submitting the form below. If you are looking for a specif part number, please include it with your message.